With the holiday weekend for Thanksgiving starting tomorrow I thought it was perfect timing to share a trick I just learned recently from a dear friend. One of the things that I know is likely to happen over a long weekend or holiday is a few emergency phone calls from patients new and old. 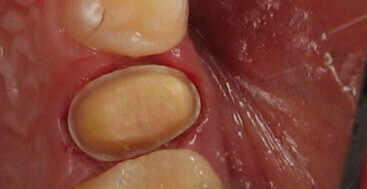 A handful of these may be due to a permanent or temporary crown coming loose. Over the years that I have been in practice I have tried suggesting a variety of ways my patients can manage this on their own. In my experience the temporary cements that they sell over the counter in drugstores are difficult for patients to use, and normally result in a mess for both the patient and I. Somewhere once I heard to have them use Vaseline as a temp cement, and I have had poor results with this approach. Other things I have heard is to use toothpaste which I never personally recommended as I was worried that it would cause sensitivity against the dentin. Recently I heard another solution, that seemed easy and workable. I promised the friend and mentor who told me this trick not to write about it until I had tried it. Well low and behold I had two opportunities very recently to give it a try and it works!! The trick is good old fashioned Elmer’s school glue. Elmer’s glue is non-toxic, so it doesn’t hurt all of the small children that ingest it. It is water soluble and easy to clean up. it is also readily available, most people have some at home already. 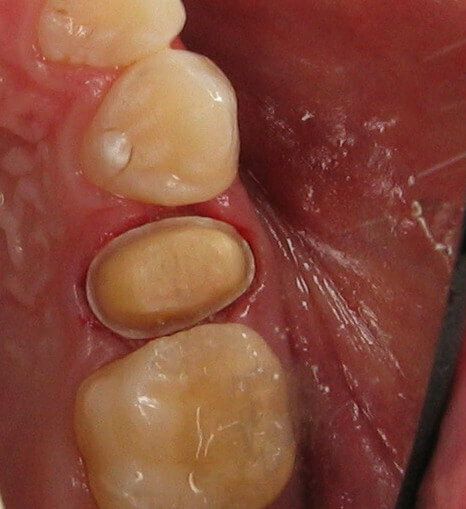 Have the patient dry the inside of the crown or temporary, they also need to dry their tooth, and biting on a folded up Kleenex works great for this. Have them take a small amount of Elmer’s and place it on the inside of the crown. They can spread it out with a toothpick to create an even coating. They than simply replace the crown over the tooth, and bite on the same tissue until the Elmer’s starts to set. I had them bite it into place for a full five minutes. I also instructed them to take the crown back out before going to bed, so it didn’t pop loose and get swallowed. Both of my patients were amazed it would be that simply, glad that they could just use something easy to find and that they didn’t have to come in after hours. When I saw them they both reported no bad taste and no sensitivity. They reported it was easy to take the crown back off before bed, and the Elmer’s peeled right out, than they did the same thing the next morning to put it back in. When I saw them the crowns came right off, and with an explorer I was able to simply peel the set Elmer’s glue out of the crown, and off the prep. This is one of those tips I wish I had learned much sooner! Thank you Lee! I’ve never had a good solution besides driving to the office. What a great hint! This is great, I am a big fan of plumber’s tape and now have another use for it! I love the plumbers/electrician tape too!!! Both of these ideas are great. I will pass them on to my doctors. Seems we always get calls when our doctor is out of the office from patients with crowns off. The elmers glue tip is an excellent suggestion.